The Federal Reserve System is bigger than the board of governors headed by Ben Bernanke; bigger than its ominous headquarters in Washington, D.C. The Federal Reserve System is the banking system, and while one of its mandates is to maintain “stable prices,” the reality is that the Federal Reserve is responsible for all of the inflation we’ve experienced since the Fed’s inception in 1913. How much inflation is that? Well, the value of the dollar has decreased by more than 95% in that time – and this is according to the government’s own Bureau of Labor Statistics. Here is a list of the three ways in which the Fed creates inflation. When the government’s expenses exceed its income – which they always do – the Treasury Department issues bonds. These bonds are sold at auction to make up the shortfall. Anyone, including individuals like you and me, can place bids on these bonds. Foreign governments, especially China, are major buyers, but so is the Federal Reserve – and here’s the magic trick: When the Fed buys $1 million worth of government bonds, it can pay for them with a check… and, unlike when you or I write a check, the Fed doesn’t need to have any money in its account – the amount of the check is “backed” by whatever its purchasing! Thus, when the Fed writes a check for $1 million, it creates $1 million in new money. This is, by definition, inflation, and it inevitably causes prices to rise. Thirty-eight percent of all banks in the U.S. are members of the Federal Reserve System, which means that they own stock in one of twelve regional Federal Reserve Banks. It also means that they are eligible to borrow directly from the Fed at its “discount window.” This rate is set by the Fed, and, as you might imagine, money lent to member banks is created out of thin air by the Fed – it monetizes the banks’ debt too. 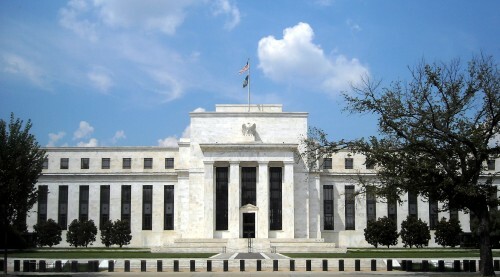 The Federal Reserve is the “lender of last resort” to its member banks, who are thus guaranteed a bailout at the Fed’s option. After all, no matter how irresponsible a member bank’s practices, the Fed could always come in and create enough money to bail it out, and this creates what economists call moral hazard in the economy. The Federal Reserve regulates all banks, not just member ones, and it has the authority to set reserve requirements for banking institutions throughout the economy. In a free market, the reserve requirement would be 100% – banks would not be able to loan funds they did not have. However, thanks to the government-enforced cartel system created by the Federal Reserve Act, banks can create up to $9,000 in new money for every $1,000 on deposit. That’s because, under the current 10% reserve requirement, banks can loan up to $900 of a $1,000 demand deposit – but then if that $900 loan is deposited at the same or another bank, up to 90% of it can be lent, and so on and so on, until the $1,000 makes $10,000 total; $9,000 in new money. Indeed, this is probably the biggest engine of inflation in the economy. Inflation is not inevitable – it only arises from an expansion of the money supply, and only the Fed controls the money supply. This is why it is so outrageous that one of the mandates of the Fed is to maintain stable prices! However, it is important to note that inflation is not synonymous with rising prices. In fact, if there were a stable money supply, prices of goods and services would go down with time, as advances in productivity and accumulation of capital make things cheaper in real (inflation-adjusted) terms. Thus, hidden in the Fed’s stable-prices mandate is the promise to inflate the money supply – and this represents theft on a massive scale. Who gets the money when the Fed creates it? A privileged class. The rest of us are cheated by higher prices. This is why the issue of the Federal Reserve is so vital – it is the one issue that is the crux of it all. As the architect of inflation, the Federal Reserve is also the primary cause for the bull market in gold and silver. This, of course, does not mean we should thank Bernanke and crew. The irony of it all is that once people wake up to what the Fed is doing – and they are beginning to wake up – it will create an even bigger bull market for precious metals. All fiat-money systems throughout history have failed. Ours will not be the exception. Only gold and silver are eternal. The Federal Reserve's headquarters in Washington, D.C.